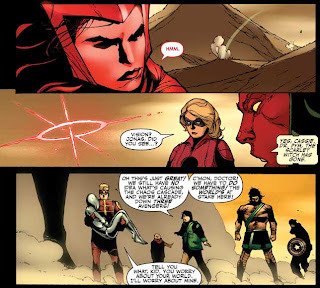 For those of you that read Duy's examination of the fall and redemption of founding Avenger Hank Pym, I wanted to follow that up with a look at the MIGHTY AVENGERS issues that followed in the wake of SECRET INVASION. 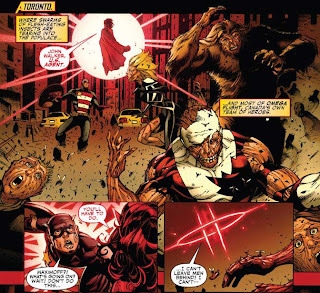 For most of you that were only reading NEW AVENGERS and DARK AVENGERS at the time, MIGHTY was the closest to that "old school" Avengers feel that so many cranky old fans talk about. 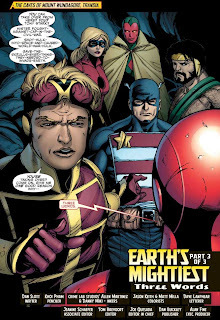 Written by Dan Slott (before he got the full-time job on AMAZING SPIDER-MAN, with spectacular results) and with Khoi Pham on art (one of my favorite artists in comics), it was the overlooked yet no less excellent book in the Avengers franchise (personally, I'd say it was the best by far). For those of you that failed to read it while it was coming out (shameful), here I am again to help steer you in the right direction. 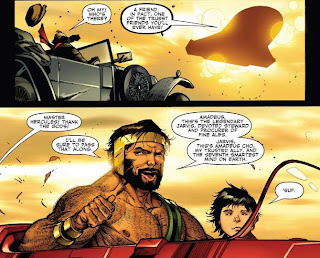 Don't worry kids, it's never too late to read good comics. 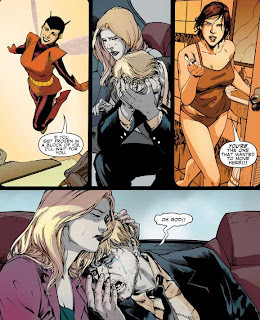 So put down those Night of the Never-Ending Owls DCnU Batman crossover comics, and let's jump into this. 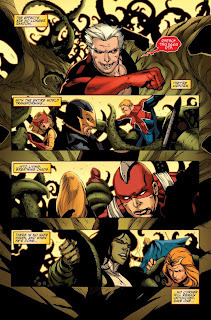 First, let's quickly cover MIGHTY AVENGERS #20 by Brian Michael Bendis and a crew of artists, which is a SECRET INVASION epilogue. 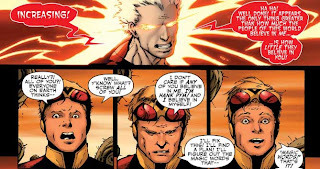 This story sees a newly returned Hank Pym struggling with his return after having been kidnapped by alien shapeshifters, and the death of his ex-wife The Wasp. 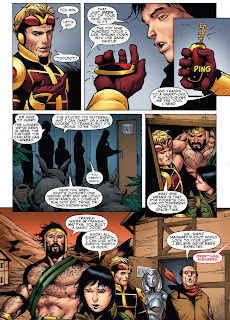 Carol Danvers catches him up on the various big events of recent years during his absence (depicted in beautiful Jimmy Cheung splash pages). That info, plus the memories of Janet, is too much for him, and he breaks down. 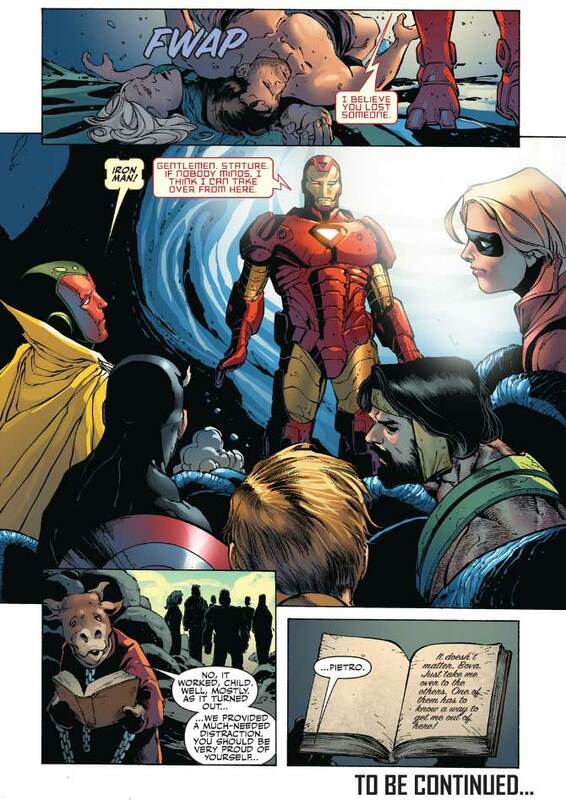 Later, at the funeral, Pym lets Tony Stark know just what he thinks about how he's been handling things lately. 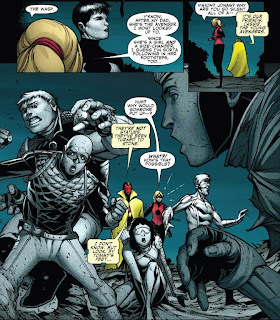 Next up is SECRET INVASION: REQUIEM, an oversized one-shot issue featuring reprints of Pym's first appearance and his infamous breakdown as Yellowjacket. Framed around these is a little story that sees Pym begin to rebuild his life, and honoring the memory of his ex-wife by taking on her codename as The Wasp. That brings us to MIGHTY AVENGERS. SPOILERS FOLLOW. #21. 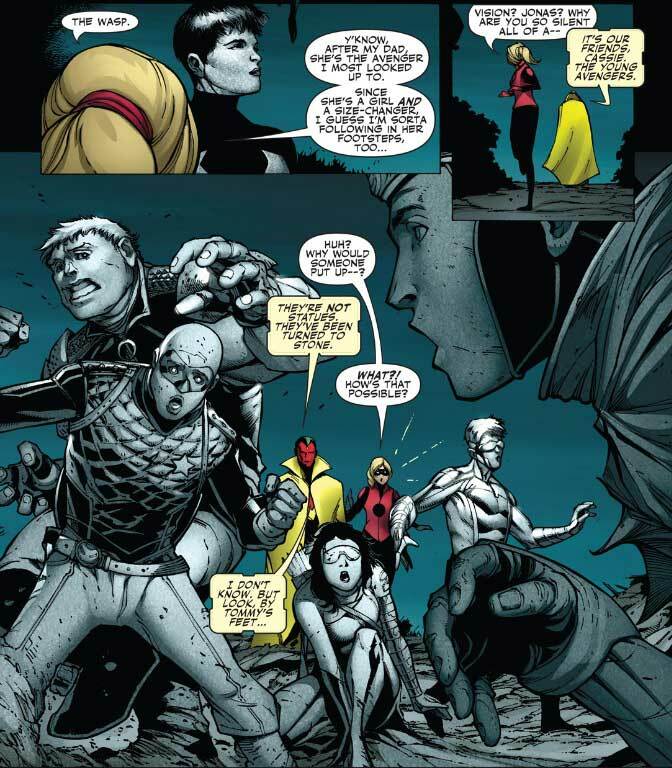 Young Avengers members Stature and Jonas arrive at Avengers Mansion, summoned by teammate Wiccan by the threat of a major mystical threat. When they arrive, they find the team turned to stone, and the effect seems to be spreading. 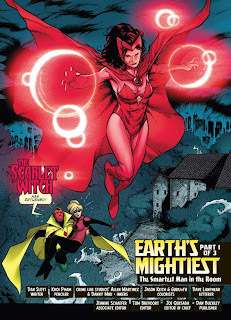 Fleeing from the mystical effect, they run into none other than the Scarlet Witch, who has been missing since the end of House of M.
Before they have too much time to react, they all disappear in a blink of Scarlet magic. All over the world there is chaos. 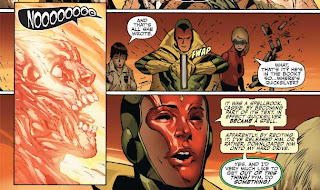 The seas run read with blood, and Wakanda is in flames. Norman Osborn, as the Iron Patriot, tries to reassure the panicked public. Faithful Avengers butler Jarvis is on his way to Oklahoma to seek the aid of Thor, but finds that Oklahoma has disappeared. 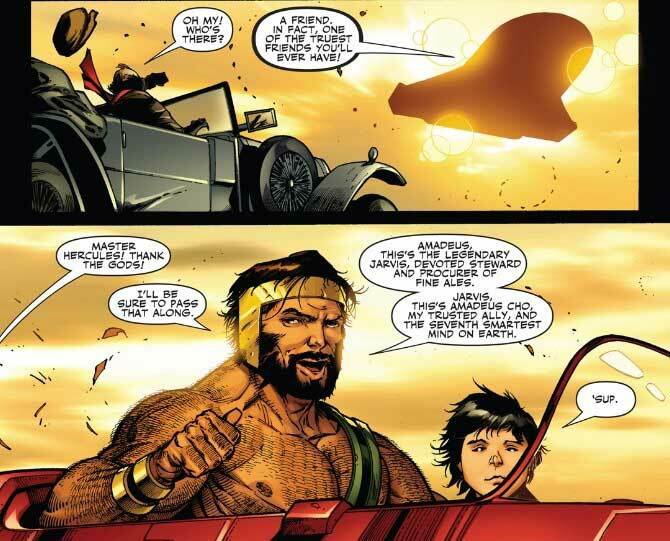 Fortuitously enough, Hercules and his ally Amadeus Cho (seventh smartest mind on Earth) happen upon him. Seems they had been looking for him specifically, to build a new team of Avengers. Because it's not a team of Avengers without Jarvis. Meanwhile, the New Avengers are not faring so well against the Chaos Cascade (Cho's name for it). Scarlet Witch arrives just in time to see Bucky Cap perish. So she moves on to her back-up super soldier. 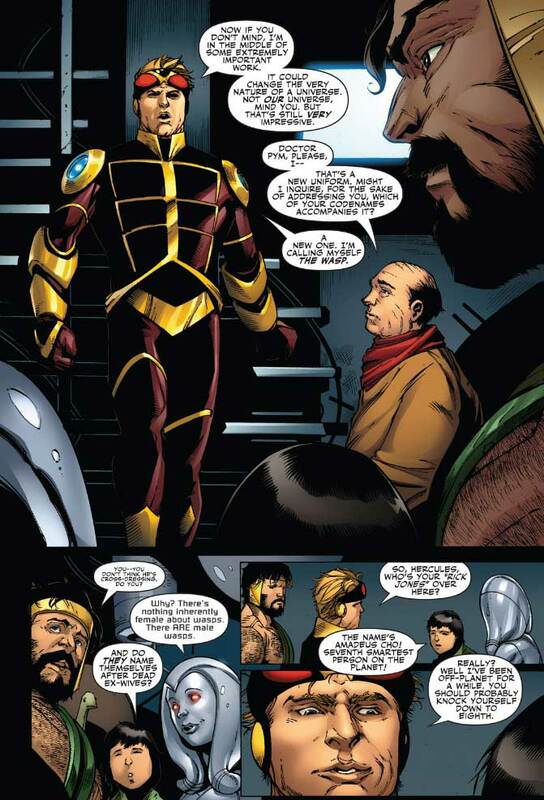 Iron Man tries to stem the tide of chaos at one of his aerospace labs, but has to make a timely retreat, just missing the arrival of the Scarlet Witch. 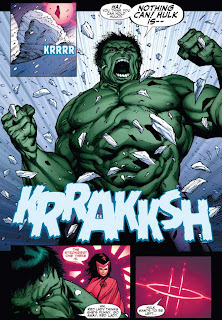 Next, she finds the Hulk having a bit of trouble in the middle of a snowstorm in the Arizona Desert. 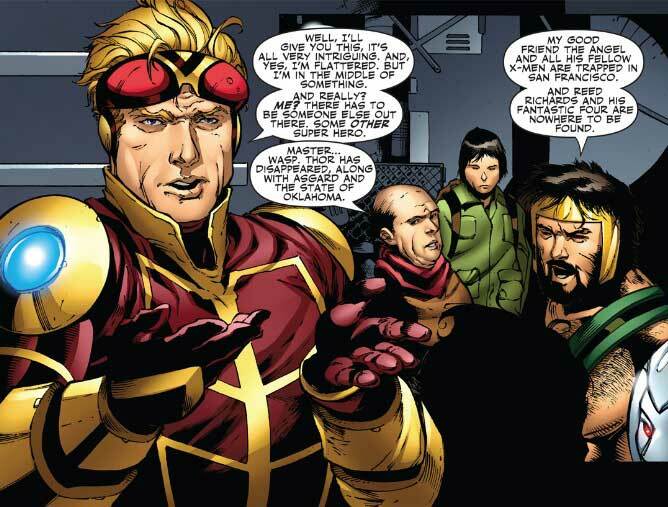 Jarvis leads Hercules and Cho through a Chicago mall, to Hank Pym's secret lab hidden in a maintenance closet. The closet is merely a gateway into a "Pym Pocket", one of his experiments into shrinking portions of time and space. 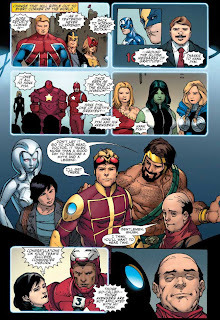 Pym has no interest in being involved with another Avengers team, and makes it a point to stick it to Cho that now he's probably the eighth smartest mind in the world. Cho and Jarvis try to convince Pym to lead them against the Chaos Cascade. Cho has narrowed down the origin of the effect to a place in Eastern Europe, a place called Mount Wundagore. In Mount Wundagore, we come upon Modred and Bova, certainly up to no good. Modred taunts an unseen captive, calling him/her "the poor child of Magda." Pym still isn't interested in helping out. Hercules presses the issue, and Pym reveals that he's not scared of the chaos at all, he's scared to lead the Avengers. 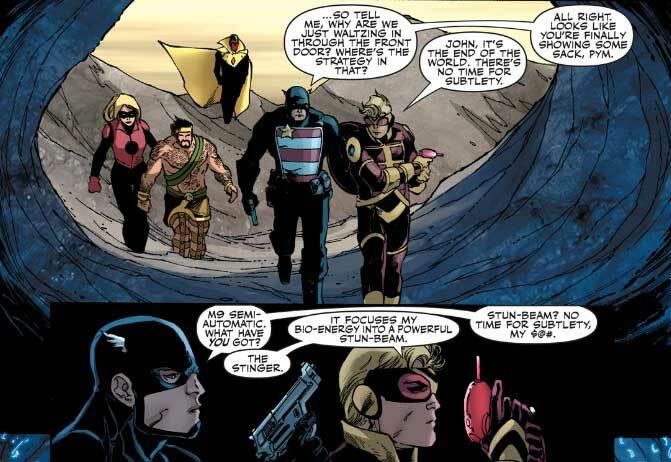 Pym recounts the earliest days of the Avengers, and his initial success with the team. 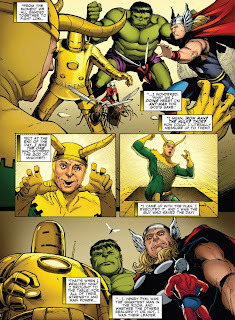 "I, Henry Pym, was the smartest man in the room. And whether the others realized it or not, I was their leader". But after a few missteps as Giant-Man, his confidence began to waver. 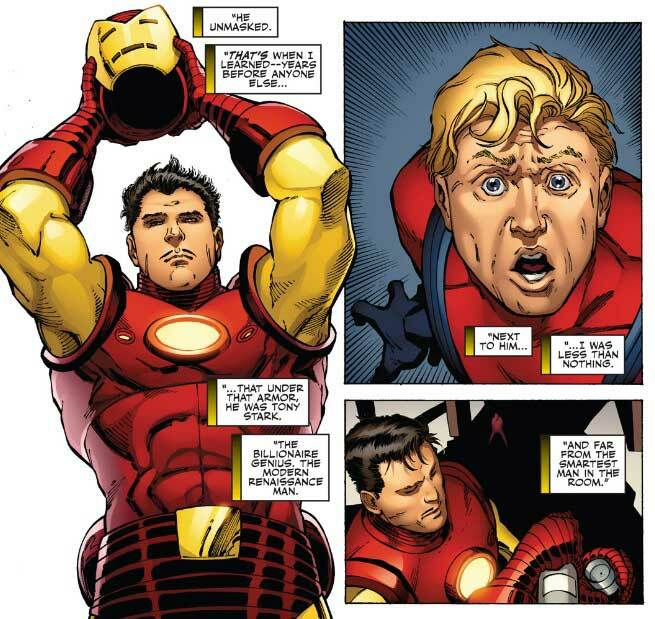 Until he accidentally discovered that Tony Stark is Iron Man, and that he may not be the smartest man in the room after all. Cho cuts him off there, recounting all the mistakes Stark has made in recent years. 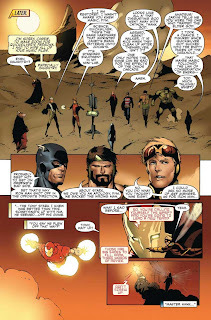 Jarvis lays down the final pitch, "Smartest or not, we need *you* in that room." Pym finally gives in, and shows them all just a few of the reasons why he's the best inventor in the Marvel Universe. "Whoa! All right…eighth. I can live with eighth. 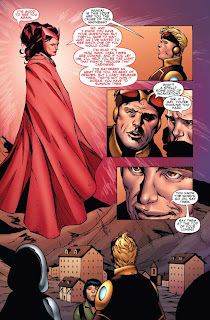 Eighth is good"
They meet the Scarlet Witch, who advises Pym that she has gathered a team for him to lead. All he needs to do is summon them. Modred has finished the ritual that will summon our story's big bad. 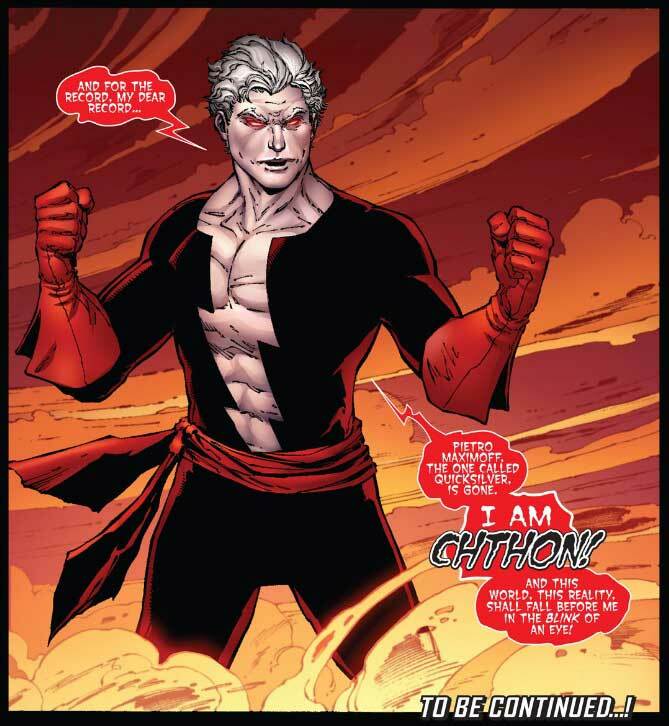 Using the captive Quicksilver as a vessel, the lord of chaos Chthon arrives. 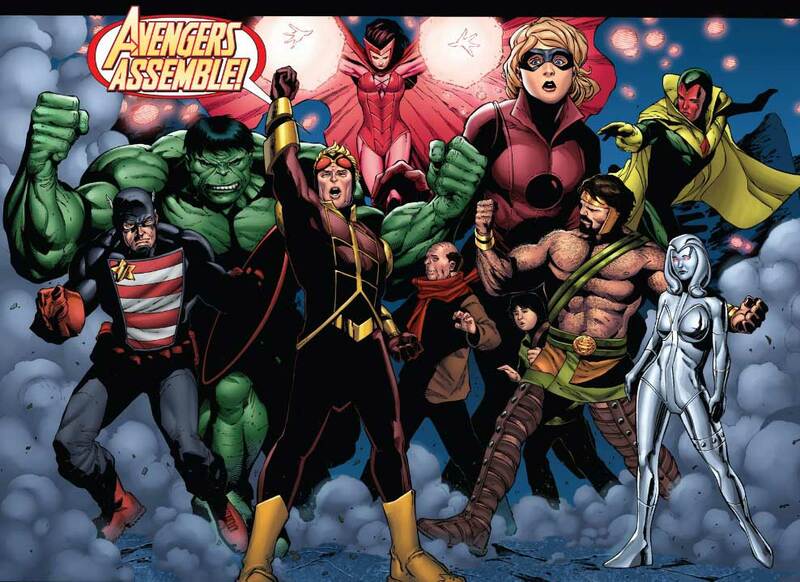 My brain thoughts: Like I said, this was much more of a classic Avengers lineup. Any of the naysayers on the internet complaining on the internet about Spider-Man and Wolverine should have looked no further than this title. 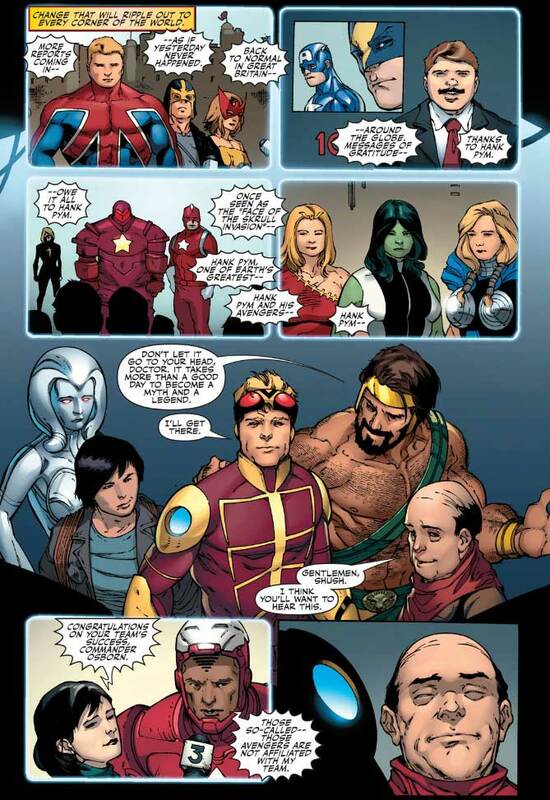 Pym, Hercules, Jocasta, and even founding member The Hulk were all here. 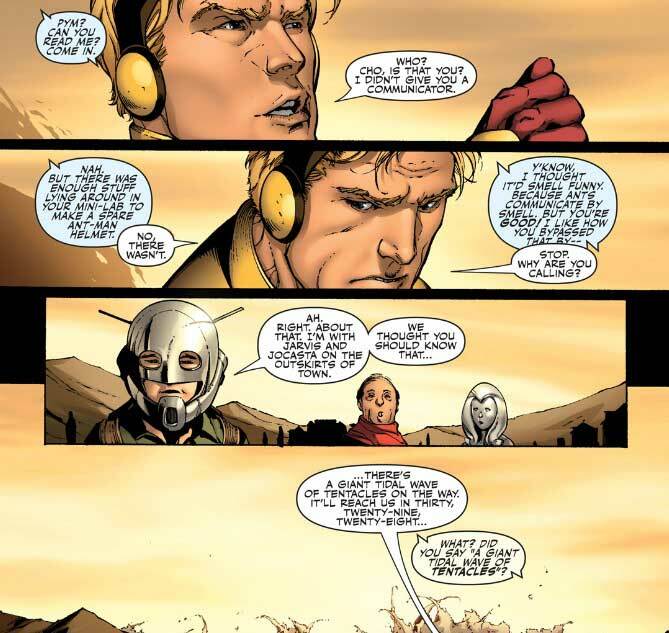 Expounding upon Pym's early insecurities with the team was a great bit of character work too. #22. The gathering of the team has the typical Marvel result of them all punching each other, with Jocasta catching a blow from the Hulk. Hulk decides he doesn't want to stick around, and Wanda disappears soon after. 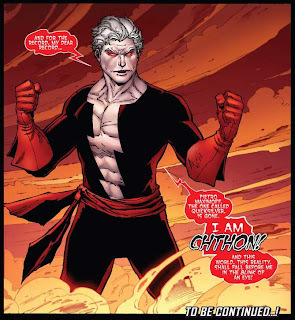 Chthon uses Quicksilver's speed to spread his chaos magic across the entire planet. 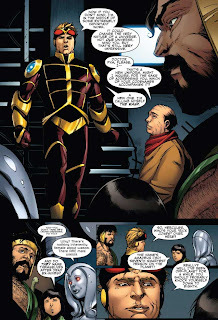 Iron Man arrives on the scene. 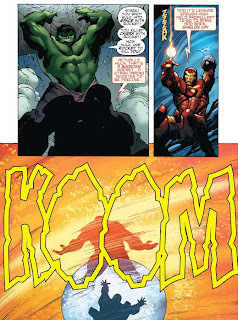 Hulk, still not to happy with Stark after PLANET HULK, greets him appropriately. 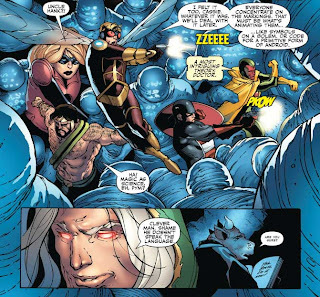 Pym and the others have regrouped at a nearby Inn. A local lets them know about the caverns below Mount Wundagore, called the Darkhold. 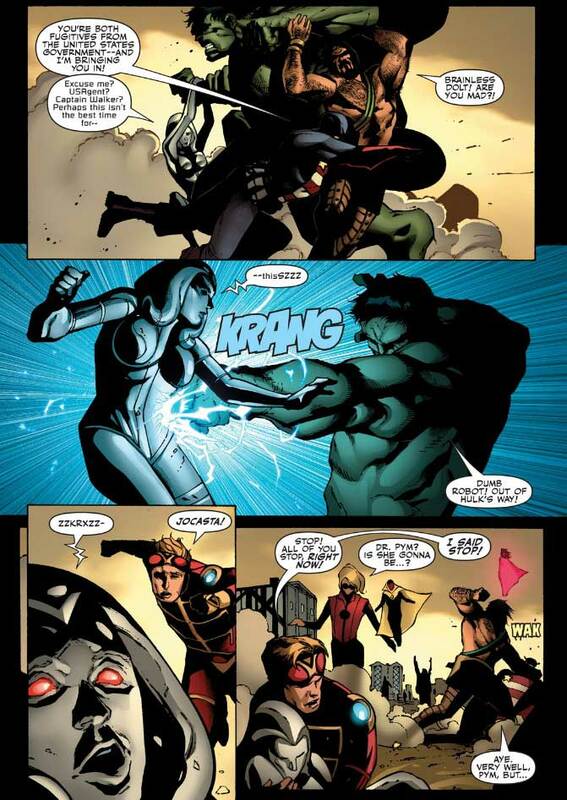 Jarvis goes to update Pym, walking in on him "fixing" Jocasta. As Hulk and Iron Man continue their battle, Pym leads the team straight into the Darkhold. There, they're greeted by Modred and his dark magics. 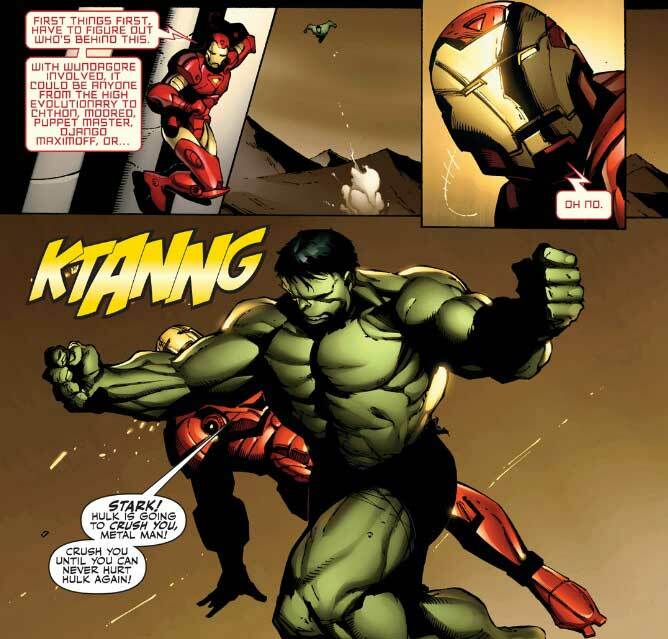 Iron Man is able to get the upper hand on Hulk. 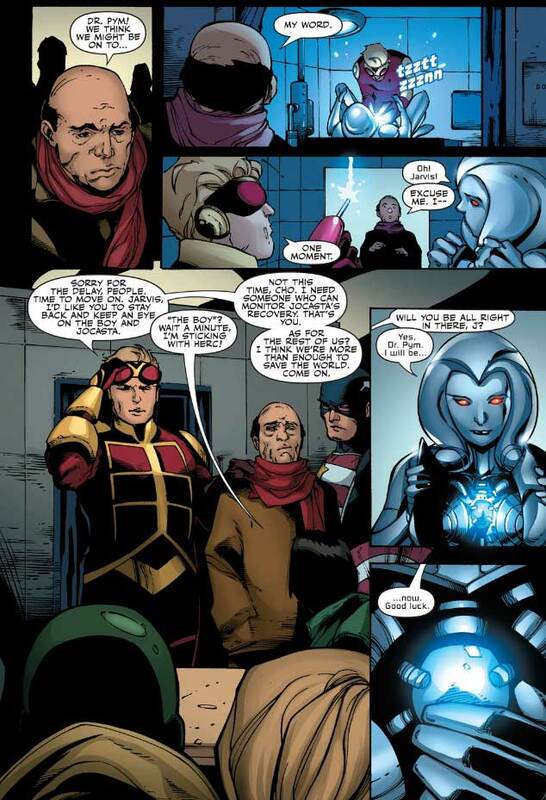 While the team battles the stone monsters, Pym notices the writing and symbols on the wall. Language is going to be important, so pay attention. 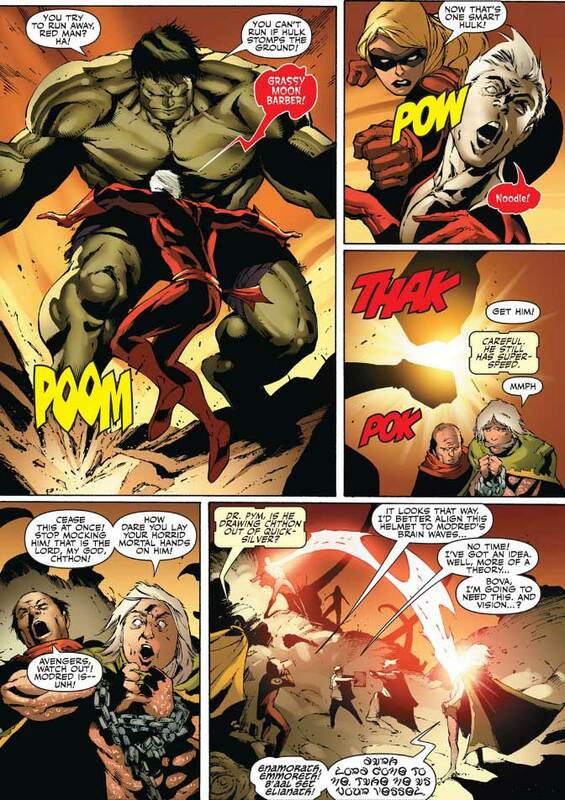 Modred is taken out by a blast from behind Pym and his team. 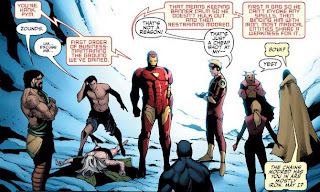 They turn around to see Iron Man, who of course has decided he will take over leadership of the team. 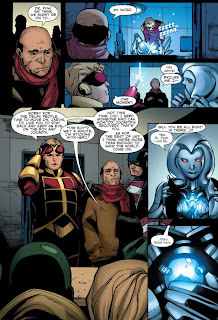 My brain thoughts: Love that page of Pym "fixing" Jocasta. Iron Man is a bit of a jerk. #23. 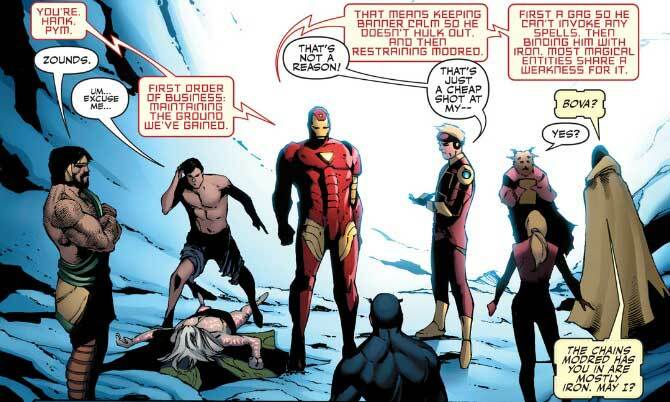 Pym disagrees just a little bit with Iron Man taking over the team. 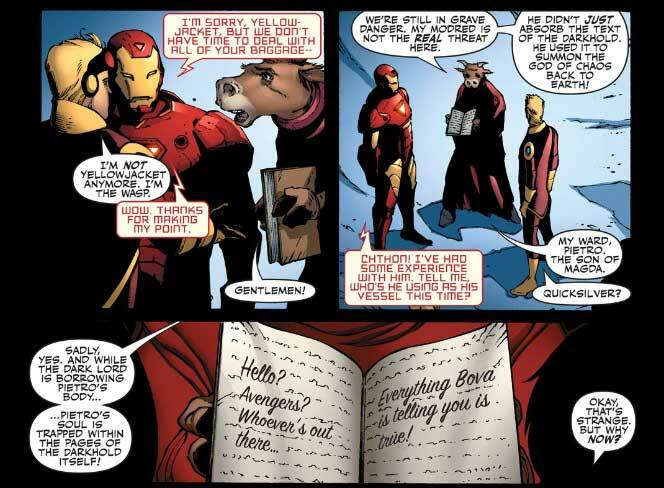 Stark's reasoning? "You're. Hank. 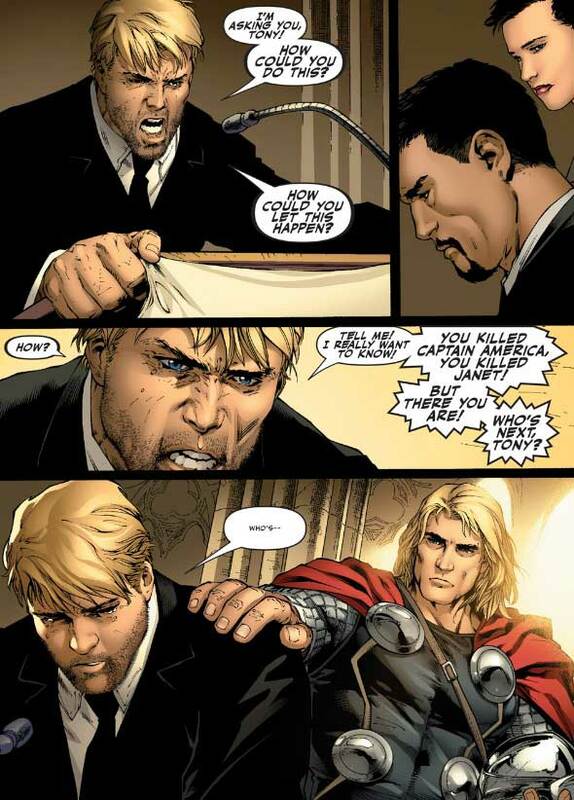 Pym." Ouch. Bova is being helpful and updating the team on the current situation. 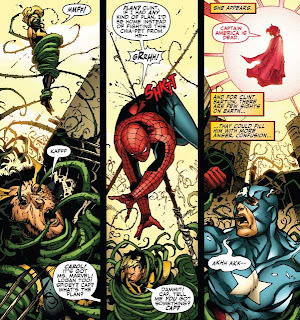 Stark uses a satellite to zoom in on the tentacles, and sees that it's a self-replicating organism, absorbing any living creature in its wake. Iron Man takes Hercules and US Agent with him, leaving Pym behind with the rejects. 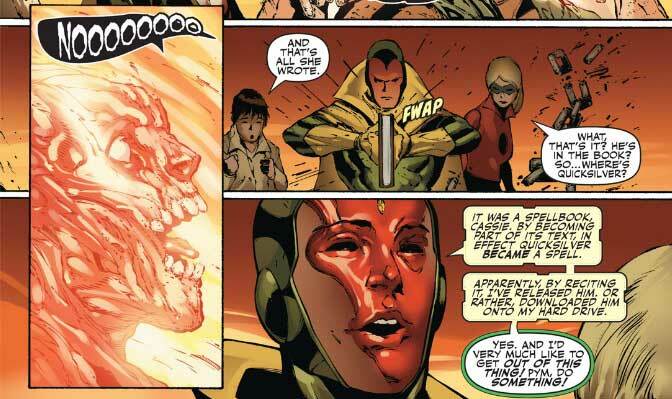 Iron Man's plan is basically to cut off the source of Chthon's power by destroying Wundagore. Cho doesn't think it's such a great plan since Wundagore is full of explosive Uranium. 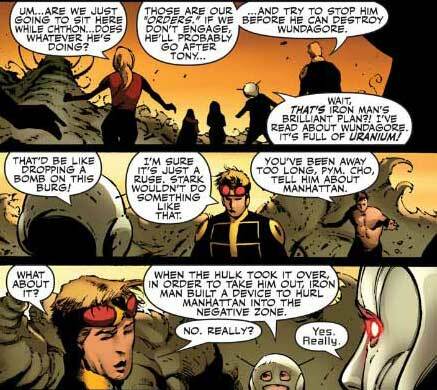 Pym wants to give Stark the benefit of the doubt, but is again reminded of Stark's recent decisions. So, it's Pym to the rescue. 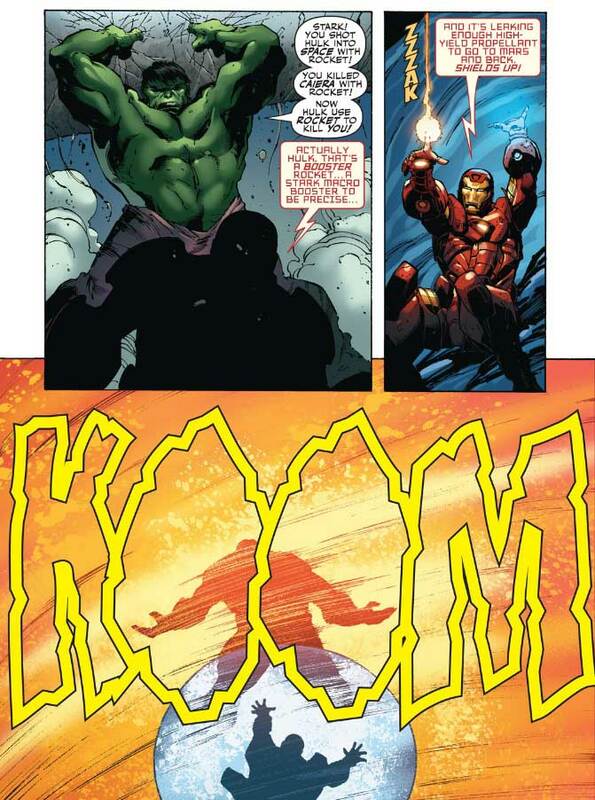 The Hulk finally enters the fray. Pym tries to use Chthon's power against him, by channeling the belief of the people. Doesn't work out so well for him, but it does give him another idea. 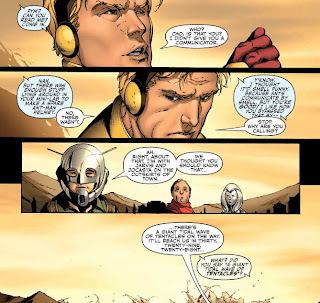 He uses the Ant-Man helmet to scramble the language center of Quicksilver's brain, leaving Chthon unable to say his spells (see, I told you to pay attention to the language talk). 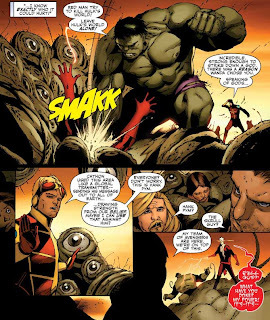 With Hulk and Stature giving him some final blows, Chthon finds himself back in the book. 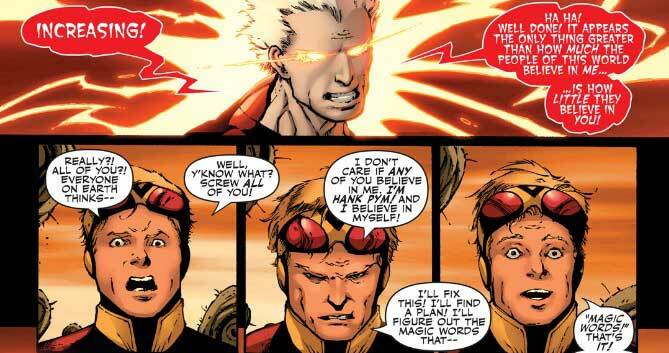 And then Jonas Vision saves Quicksilver from the book by "downloading" him. US Agent and Hercules offer their apologies for abandoning Pym, and Iron Man gives about as close to an apology as he'll give. Pym is resolved to lead this new team of Avengers, and offers them all to join him. 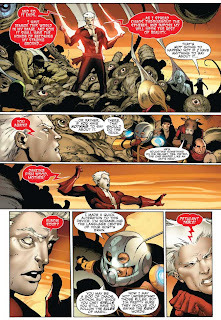 Quicksilver isn't interested at first, until he sees his long-lost sister the Scarlet Witch come and go. The world comes together to give thanks to Hank Pym and his team of Avengers for saving the day. 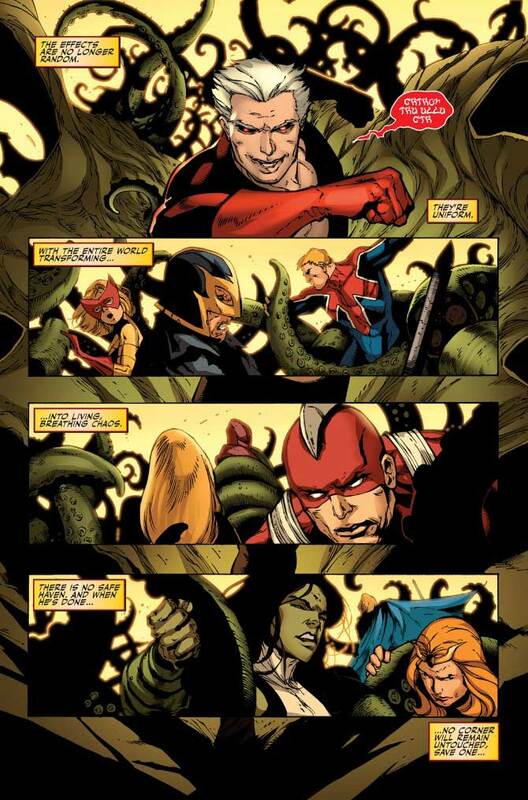 Much to the chagrin of Norman Osborn and his team of Dark Avengers. 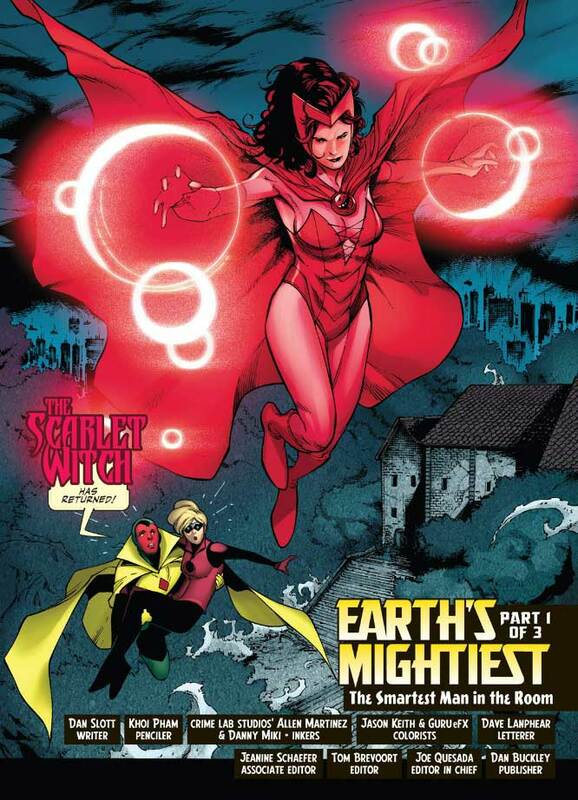 So I bet you have been wondering why you never heard about the return of the Scarlet Witch happening in this series. 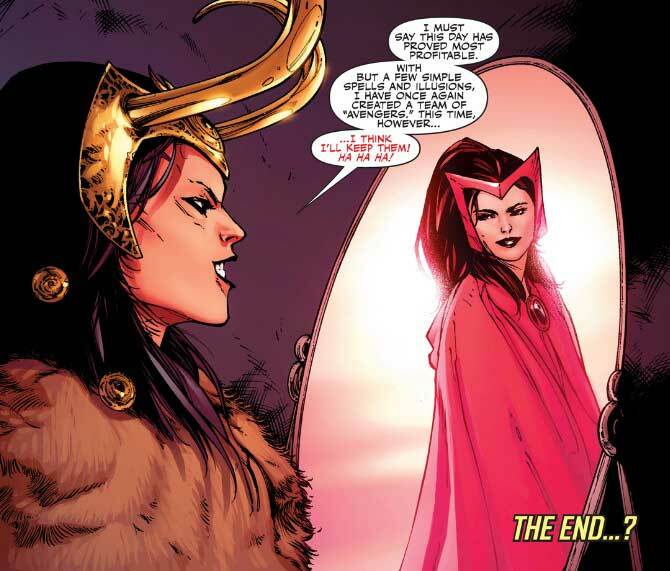 Well, turns out, it's not the Scarlet Witch after all. 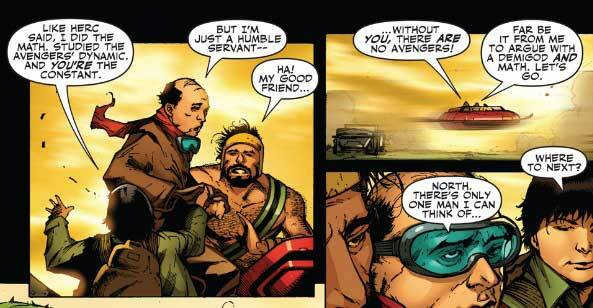 It's been original Avengers villain Loki in disguise! My brain thoughts: Loved it! 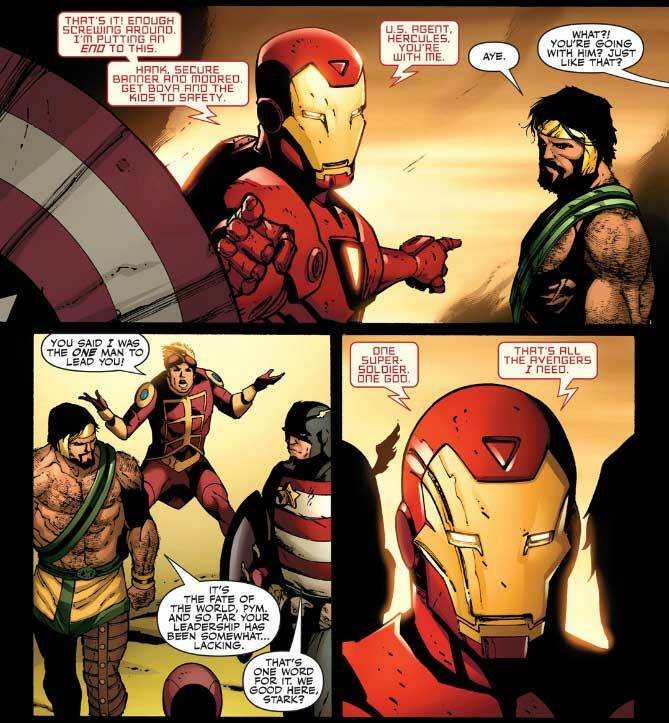 Iron Man humbled. 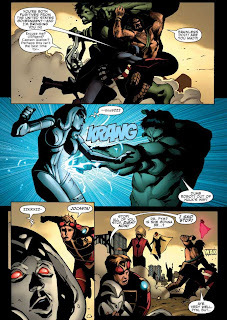 Pym saving the day. I've been telling people for years that this is the ultimate Hank Pym series. 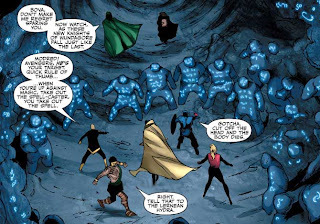 Having Loki behind the forming of this team was a stroke of brilliance on Slott's part. 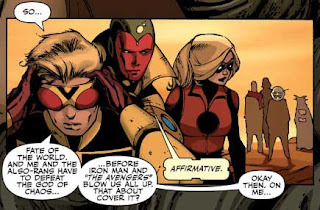 He's always been fantastic at using continuity as a tool to enhance a story, not hinder it.